Working full-time for a single employer is no longer the norm in advanced economies. Instead, millions of “independent workers” – self-employed, freelance, or temporary employees – sell their labor, services, and products through digital platforms to numerous employers or clients. The growing share of independent work, which typically entails flexible hours, promises to bring significant aggregate economic gains, by raising labor-force participation rates, increasing the overall number of hours worked, and reducing unemployment. But the “gig economy” also creates complex new policy challenges in taxation, regulation, and access to social benefits and protections that traditionally have been provided through standard employer-employee relationships. According to a McKinsey Global Institute study , up to 162 million people throughout the United States and the EU-15 are currently engaged in some form of independent work. Based on a representative online survey of 8,000 workers in six countries (including the US), McKinsey found that 10-15% of the working-age population relies on independent work for their primary income. Another 10-15% – including students, retirees, household caregivers, and those with traditional jobs – take on such work to supplement their income. 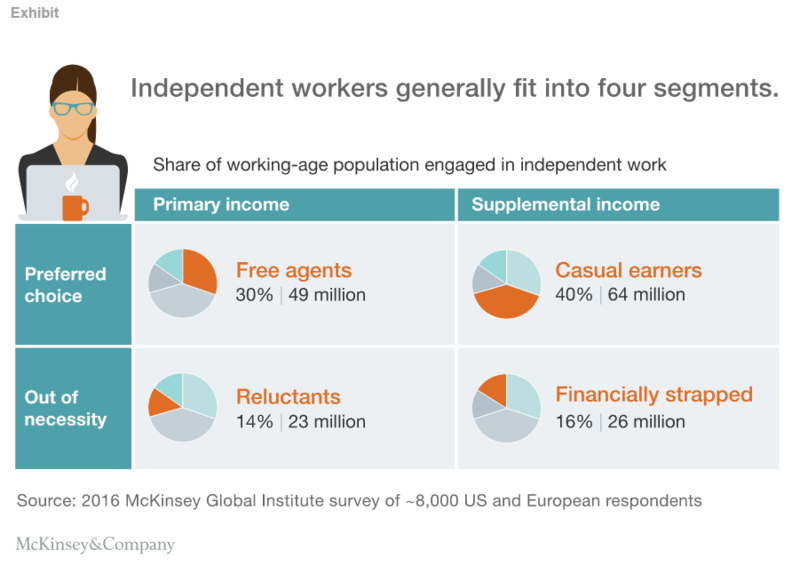 McKinsey’s findings challenge several common beliefs about independent work. First, the independent workforce is not dominated by young people: people under age 25 represent just 25% of independent workers. The independent workforce is also diverse in terms of income level, education, gender, occupation, and industry. Moreover, 70-75% of those engaged in independent work do so by choice, rather than out of necessity – a finding that is consistent with the results of other recent studies . Indeed, although 40-55% of low-income workers (earning $25,000 or less per year) engage in some independent work, they comprise less than 25% percent of all independent earners. Only about one-third of survey respondents said they rely on independent work because they cannot find conventional jobs or need supplemental income to make ends meet. That minority, however, still amounts to a large number of people. It is estimated that more than 50 million Americans and Europeans are engaged in independent work out of necessity, and more than 20 million rely on independent work as their primary source of income. Many are low-income workers who would otherwise be unemployed. This suggests that stronger economic – and, thus, employment – growth would reduce the number of workers engaged in independent work. But, regardless of macroeconomic conditions, independent work is likely to account for a rising share of work in the long run, owing to technological advances and individual preferences. While digital platforms for independent work are still in the early stages of their development, and are being used by only 15% of independent workers, they are proliferating and expanding rapidly. McKinsey estimates that 30-45% of the working-age population would prefer to earn an income, whether primary or secondary, from independent work. That trend poses challenges and opportunities for policymakers, workers, and employers. Policymakers need to collect better data on the independent workforce through regular surveys. They must also update how independent workers are categorized, in order to adapt taxation, regulation, and benefits and protections (including anti-discrimination laws and minimum wages) accordingly. The policy issues for high-skill professionals acting as independent agents are not the same as those for low-skill workers selling their services through large digital platforms like Uber. Updating the provision and delivery of benefits may be particularly challenging. Some European countries are tackling the issue by creating new classifications of work, with new benefit systems. British law distinguishes between traditional employees and “workers,” who are entitled to only some employee rights. In the US, there is a growing interest in a system of portable, pro-rated benefits – such as unemployment and disability insurance and pensions – tied to workers, rather than employers. Another option in the US would be new unions or collective organizations (guilds) of workers, both to negotiate the terms of independent-work contracts and to track and organize benefits for workers who serve many clients and employers. Similar systems are already in place for the construction and entertainment industries. Entrepreneurs also have opportunities to create new products and services tailored to the needs of the independent workforce. These could include shared office spaces, financial solutions that smooth out income between work assignments, training programs, and the creation of widely recognized credentials to enable independent workers to advance their work and income opportunities. Employers, for their part, will need to learn when to rely on internal talent and when to turn to independent workers. Many factors will influence that decision, including cost, quality, productivity, and the security of proprietary information. Finally, there is the responsibility of workers themselves to assert more control over their own careers, seeking opportunities and developing differentiated skills to avoid being relegated to a low-wage generalist talent pool or displaced by intelligent machines. This may prove to be the most important element of the emerging labor-market transformation: workers are a driving force behind it. Of course, digital technologies have also played a vital role in facilitating the rise of independent work. Digital platforms like Airbnb, Etsy, and Uber have been critical in reducing the friction and increasing the transparency of the markets that support independent work. And innovation in this area remains robust. But it is these platforms’ users who are really reshaping the labor market. Aided by digital technologies, they are advancing their own interest in earning more, while benefiting from more flexible working arrangements. The likely result of this trend will be a shift from the old model of business organization – in which most workers carry out specialized functions for a single employer within a rigid hierarchy – to one centered on lean core organizations that rely on a loose network of external providers for many tasks. Whether this new system is actually good for workers, employers, and economies, however, will depend on how all of the relevant actors address the challenges inherent in the transition.